Kyle Mullins ’22 comes to Hanover from sunny St. Petersburg, FL. In high school, he was Editor-in-Chief of The Chronicle high school newspaper, Honor Council president, a leading member of the Model UN team and a varsity track athlete. At Dartmouth, Kyle continues to pursue his passions for journalism and politics as a news reporter for The Dartmouth, a member of DartMUN, a public programming assistant for the Rockefeller Center, and a participant in the Great Issues Scholars program. He plans to study some currently undeclared combination of economics, history, government and public policy, and hopes to pursue journalism or politics after graduation. In the rare moments where he decides to relax, Kyle enjoys climbing at the Dartmouth climbing gym, listening to podcasts, reading far too much news and playing "Legend of Zelda: Breath of the Wild." Justin Mankin is an assistant professor of geography at the College who specializes in climate change and climate modeling. Candidates for SA president and vice president will elaborate on their platforms and discuss their ideas tonight in a debate moderated by The Dartmouth at 7:30 p.m. at Dartmouth Hall 105. Voting begins at 8:00 p.m.
Massachusetts senator and Democratic presidential candidate Elizabeth Warren drew a crowd of over four hundred students and local residents for a campaign event at the Hanover Inn on Saturday. The New Hampshire Senate has taken a major step toward paid family and medical leave in New Hampshire. The Granite Caregiving Act, a major priority of the new Democratic majority, passed on a party-line vote last week. The bill, symbolically called Senate Bill 1, would establish a statewide paid family and medical leave insurance program funded by a tax on employers. The possibility of legalizing marijuana has reached New Hampshire, and its chances of success have never been higher. House Bill 481, introduced in the state House of Representatives in January by state Rep. Renny Cushing (D-Hampton), would legalize, regulate and tax cannabis, making New Hampshire the 11th state to do so. The mental health crisis on college campuses across the nation has come under scrutiny. 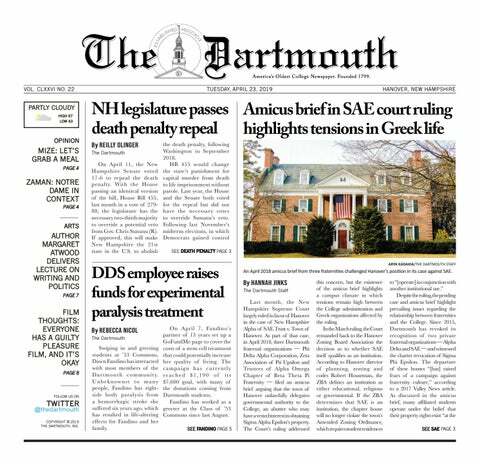 In a recent study focusing on the eight Ivy League schools, Dartmouth earned an “F” for its leave of absence policies in a new white paper — a paper that seeks to explain an issue and persuade readers of the authors’ philosophy — from the Ruderman Family Foundation, a private philanthropic foundation that advocates for disability rights.